Rally for Nature to Westminster & the case for Fracking in Haxey? Readers unable to visit Westminster tomorrow to connect with the various parties and politicians and ask them to “Rally for Nature” have hopefully dropped them a line asking them that they take a little time out from their hectic schedules to listen to erudite “Conservation” party people who have, the day before the end of the inglorious grouse shooting season felt compelled to travel to London to ask them to act in matters crucial for the wellbeing of the natural environment and the wildlife which is there (or should be) for all to enjoy. Interestingly I received a request to validate my standing as a constituent and I was provided with a link, where I was told I could find out who my MP was. It didn’t work! I suspect that even if it had it would offer me a neighbouring MP (someone I generally get on with ok), oh the joys of Government funded software? Anyway, let’s see what replies or excuses we get and let’s see what the media make of the “Rally” – good luck all and I wish I could be with you! 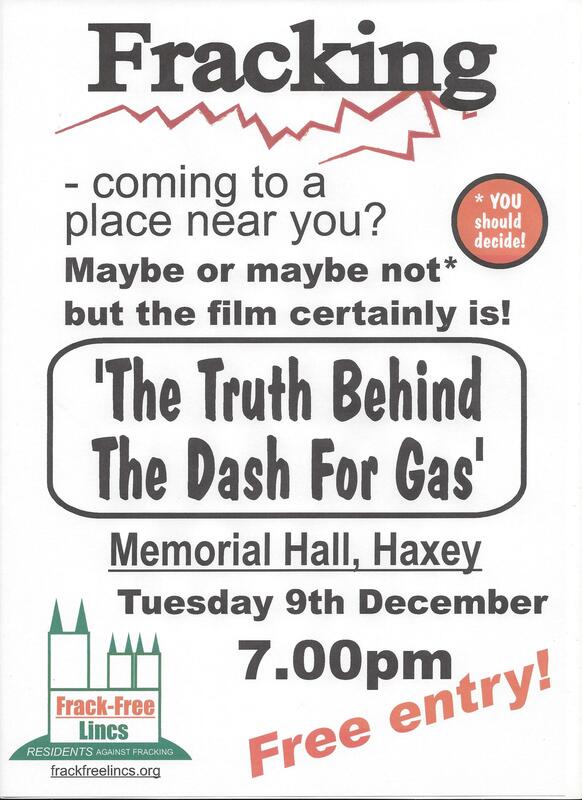 In the interim, another reminder that what looks like an excellent film is scheduled for local screening at Haxey Memorial Hall tomorrow evening at 7pm. As with all propoganda pedalled by private companies whose principle motivation is profit I recommend that we should look behind the promises and seek out the facts, robust scientific evidence and then – ever an agnostic, analyse it and make up our own minds on the merits of any case. Let’s hope that there are representatives of the fracking industry present to answer questions and provide assurances, after all both sides deserve the opportunity to present their case …. I look for information through trusted sources and the October edition of British Wildlife magazine had an excellent item in its ‘Conservation News’ columns. Apparently, according to recent research the UK holds enough shale gas to supply its entire gas demand for 470 years, promising to solve the country’s energy crisis and end its reliance on fossil-fuel imports from unstable markets. University of Manchester scientists say that they have now conducted one of the most thorough examinations of the likely environmental impacts of shale-gas exploitation in the’ UK in a bid to inform the debate surrounding fracking. The paper Life cycle environmental impacts of UK shale gas by Laurence Stamford and Adisa Azapagic is available via Science Direct Applied Energy as a download. As any reasonable person would expect, there are pros and cons. The review of recent research also identified an American study presented at a recent meeting of the American Chemical Society in August. The American study raised concerns over several ingredients of fracking fluids. The scientists say that, of nearly 200 commonly used compounds in fracking, very little is known about the potential health risks of about one-third, and eight are toxic to mammals. Among the compounds used are gelling agents to thicken the fluids, biocides to prevent microbes from growing, sand to prop open tiny cracks in rocks, and compounds to prevent pipe corrosion. The researchers state that there are a number of chemicals, such as corrosion inhibitors and biocides in particular, being used in reasonably high concentrations that potentially could have adverse effects, and some are of known toxicity to aquatic life. For about one-third of the approximately 190 compounds which the scientists identified as ingredients in various fracking formulas, very little information was found about toxicity and physical and chemical properties. July saw the opening of the bidding process for companies seeking licences to explore for onshore oil and gas, with a very large proportion of England, and lesser areas of Wales, Scotland and Northern Ireland, on offer. The primary intention of this licensing round is to enable companies to apply for licences to explore for shale-gas extraction. 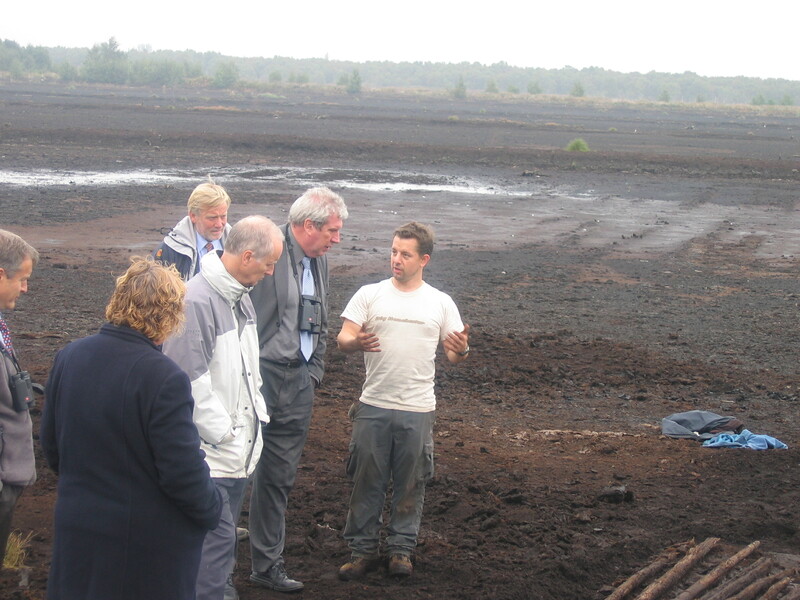 The Department of Energy and Climate Change will require detailed ‘Statements of Environmental Awareness’ to be submitted with licence applications covering National Parks, The Broads, World Heritage Sites and Areas of Outstanding Natural Beauty, ‘to demonstrate applicants’ understanding of the environmental sensitivities relevant to the area proposed’ – but there is no mention of SSSls or European Protected sites. This the government should urgently review, so say The Angling Trust, National Trust, RSPB, the Salmon and Trout Association, The Wildlife Trusts and the Wildfowl and Wetlands Trust. Earlier this year, this coalition published a major review of the risks that shale-gas extraction could pose in the UK, which concluded that fracking includes a range of significant risks to the natural environment and that government policy to address these risks was not fit for purpose. 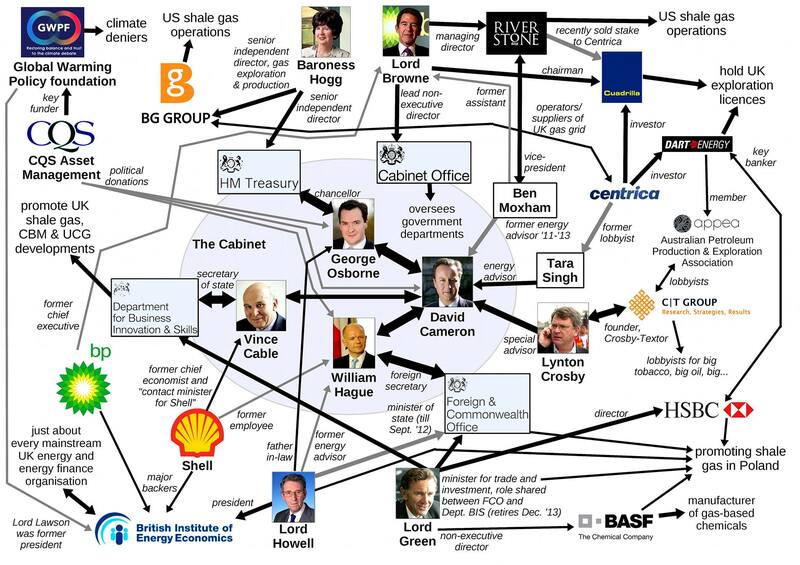 In the report, Are we fit to frack? the group put forward a number of other recommendations that dealt with how the fracking industry needs to be regulated. 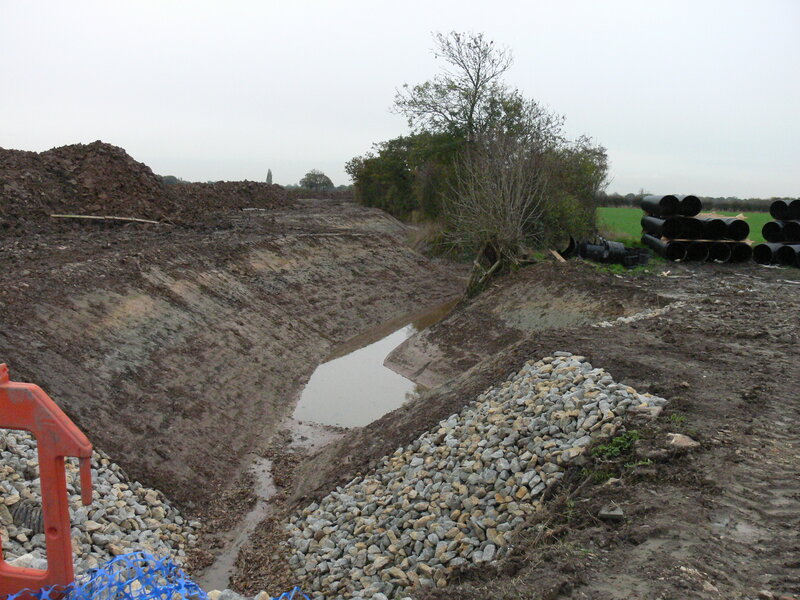 These include, for example, the requirement that all applicants for fracking developments undertake a statutory environmental- impact assessment, and independent monitoring of key environmental risks such as methane leakage. Not all of these recommendations have been addressed by the planning guidance issued on the launch of the bidding round. Thus, the ‘conservation’ coalition [as oppossed to the political ConDem coalition] is calling again for all protected wildlife areas, nature reserves and national parks to be frack-free zones, for full environmental assessments to be carried out for each drilling proposal, and for the shale-gas industry to pay the costs of its regulation and any pollution clean-ups. It is worth reading the coalition’s response to the government’s planning guidance. Another report, providing the evidence base for the coalition’s standpoint Hydraulic fracturing for shale gas in the UK: Examining the evidence for potential environmental impacts’ is another document worth examining. A sceptic might be forgiven for enquiring if the failure to require full open transparent conduct of business be another item on the catalogue of concerns that we need to issue to anyone interested in our vote come the General Election in just 149 days time? Posted in Executive Secretary | Comments Off on Rally for Nature to Westminster & the case for Fracking in Haxey? 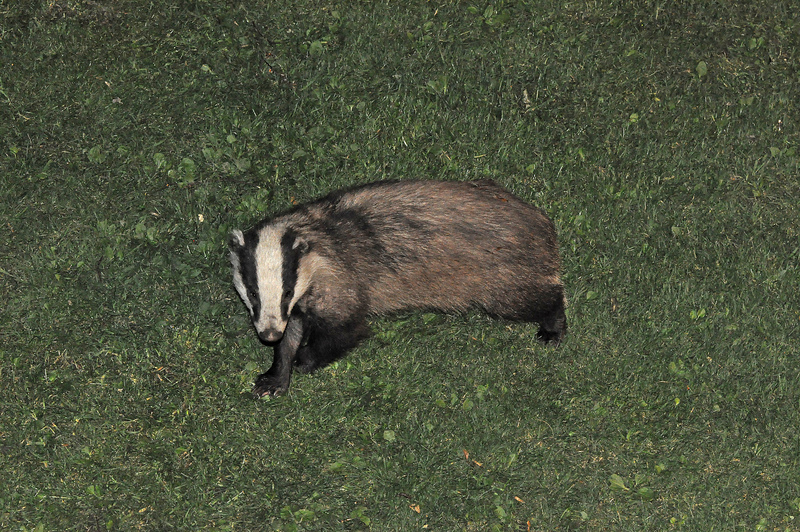 The Badger Trust are to be congratulated …. The Badger Trust will be in the High Court on Thursday 21 August for a Judicial Review challenge against the DEFRA Secretary of State Liz Truss and Natural England on the Government’s highly controversial badger cull policy. The Judicial Review will argue that Liz Truss and Natural England have unlawfully failed to put in place any Independent Expert Panel for the continued culling of badgers in Gloucestershire and Somerset in 2014. The Trust contends that the use of such a Panel to oversee the design of data collection, its analysis and interpretation was promised by the Secretary of State. Without such a panel, there can be no proper assessment of the safety, effectiveness and humaneness of the culling operation, something that would be needed before any lawful decision could be taken to continue with further culls around the country. The Badger Trust legal challenge has received strong support from some members of the Independent Expert Panel (IEP) set up by the Government to monitor the safety, effectiveness and humaneness of the badger culls carried out in 2013. 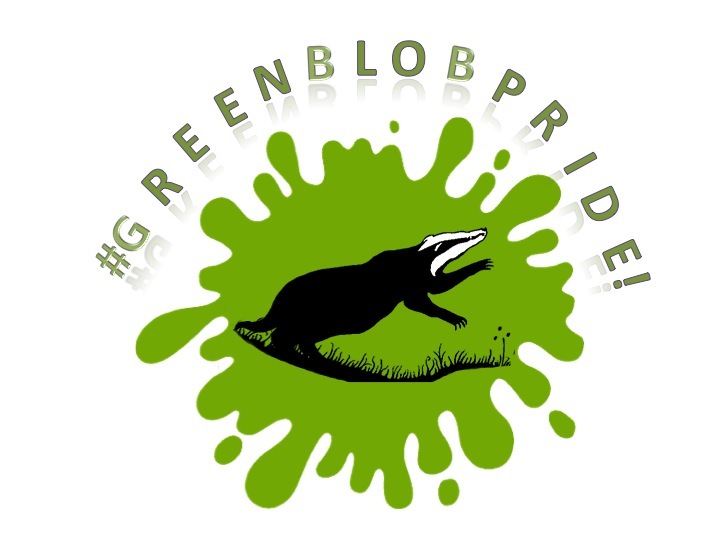 “The refusal of the DEFRA Secretary of State to put in place any independent monitoring of the badger culls due to commence in Gloucestershire and Somerset over the next few weeks, against the advice of the Independent Expert Panel which DEFRA set up, is a national disgrace. “The caring, compassionate British public will not remain silent whilst NFU contract gunmen move through our countryside at night shooting badgers with rifles and shotguns despite serious concerns regarding the levels of training, monitoring and scrutiny. We know from recent reports in the Sunday Times that contractors employed by both the NFU and Animal Health Veterinary Laboratory Agency were alleged to have regularly breached operating procedures by falsifying hair trap data, stalking badgers outside designated cull zone areas and using firearms in a way that put public safety at risk. “I am very pleased to see that we have strong support from members of the Independent Expert Panel for the Judicial Review challenge brought by Badger Trust. Coincidentally The Wildlife Trusts have just published their Badger Vaccination Progress Report 2011 – 13 and this in conjunction with the findings of the IEP puts another metaphoric nail in the coffin of the ‘cull’ argument? 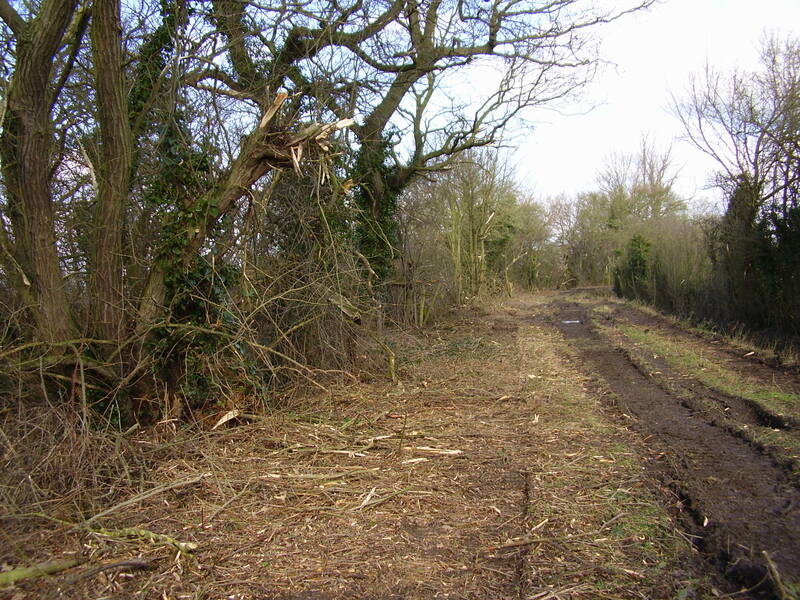 Natural England appear to be failing the nation’s wildlife and special places? They dropped the case against the Walshaw Estate and made an astonishing agreement which effectively funds grouse moor management. Thankfully the RSPB have subsequently taken the case to Europe. Their ‘Briefings’ of October 2012 and March 2014 can be found here and here. 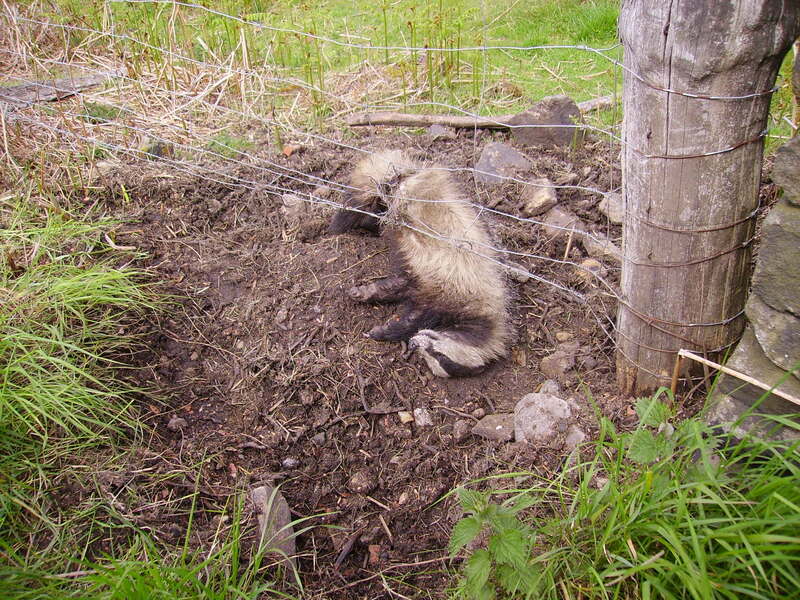 Why is it that NE appear to fail to ensure robust science where badger culling is pushed through? In 1997 their predecessors (English Nature) were described in a WWF Report as “A Muzzled Watchdog”, they morphed to become Natural England and one wonders what of the future for them with an ever changing climate around government attitude to environmmental conservation and wildlife? With the window of opportunity that a Bank Holiday Monday provided how many of you were out there benefiting from the experience of interacting with our declining wildlife? How many of you later in the evening tuned into Springwatch to learn what many of us have been recording? At least Chris Packham recommended viewers download and read The State of Nature Report and for that he is to be applauded. I’d be curious to learn how many ‘hits’ the RSPB website got subsequent to his ‘plug’. It makes pretty depressing reading, one of the report’s headlines reads …. We have quantitative assessments of the population or distribution trends of 3,148 species. Of these, 60% of species have declined over the last 50 years and 31% have declined strongly. One might wonder what the Government response to this will be, denial or a public relations exercise rolling out case studies of funded ‘biodiversity building’? What the report and programmes like Springwatch should encourage us all to do is to get out there and record the biodiversity then the evidence is there for those who write such ‘natural history obituaries’. It might also encourage those who pproclaim themselves as guardians or champions to try a bit harder and actually safeguard and protect declining habitats and species. There is certainly some stunning invertebrates about at the moment for those with patience to capture on camera. The hoverfly Dasysyrphus albostriatus (another stunning shot captured here at Crowle by Phil Lee) is a woodland edge species and widespread throughout much of the UK. With around 276 species known to Britain, they make a good group to study. 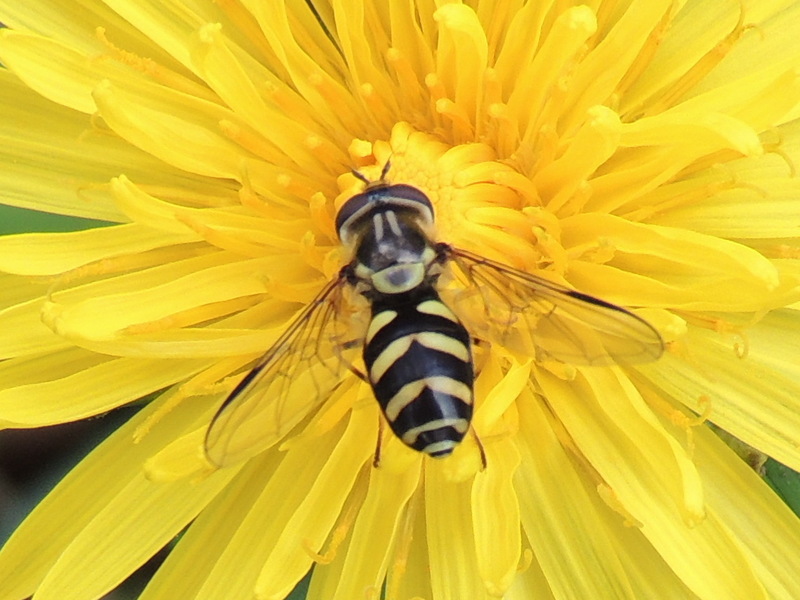 There is a Hoverfly Recording Scheme and more details can be found here. 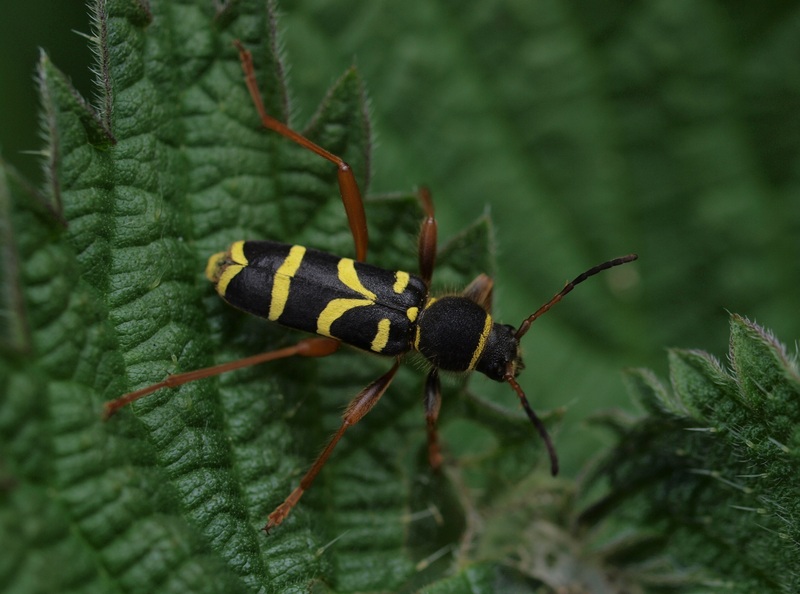 This superb image of the wasp beetle Clytra arietius was taken by Steve Hiner on Thorne Moors recently. A long-horn beetle whose larvae feed on the wood of deciduous trees which have an association with fungi. The adults feed on pollen and females supplement their protein intake by taking smaller insects as well. 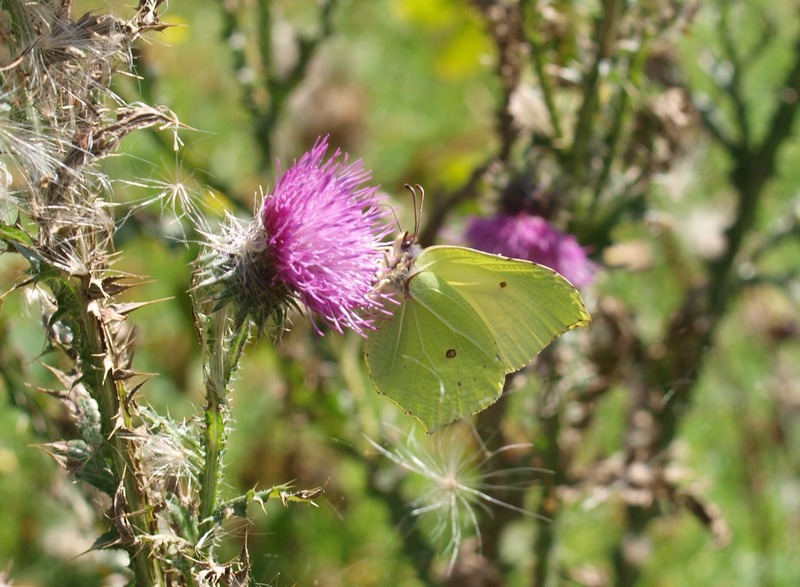 One of the earliest butterflies to emerge in spring is the stunning sulphur Brimstone, another of Steve Hiner’s Thorne images. I suppose the four peacock butterflies sunning themselves on 4 January don’t really count as they would have been tempted out of hibernation. So, get out there before it’s too late. Get out there and make a difference. Despite the depressing reading to be had, the interaction with the natural world always re-invigorates determination to challenge and change when opportunities present themselves. The UK Government agency responsible for nature conservation appears to be attracting a lot of press coverage recently. Sadly, it is for all the wrong reasons. I seem to recall that Natural England once had a strap line describing themselves as being the guardians of the countryside but I may be mistaken. There are a few rare species, gems within their ranks but they are in decline and as difficult to save as the nations diminishing wildlife. Three quite damming articles have appeared in the last two days. On the 22 May Tony Juniper writes about the anti nature narrative being hard to fathom. Juniper like many hardened campaigners and advocates for environmental conservation, is not expecting the ‘ConDem’ Government to strengthen wildlife protection after the reveiew of EU environment laws. Given the language used in the Terms of Reference it’s easy to see how anyone could fail to draw the same conclusion. Then on the following day, 23 May Damien Carrington writes about Goverment licensing to cull raptors, a historic precedent without any public consultation. Then the other item by Leo Hickman reveals more wildlife culls. Much of the information upon which the articles are based has been secured through Freedom of Information requests made by the media or the RSPB. It may be that if this continues, that FoI legislation might be the next target for review and reform, perhaps it already is? Clearly the role of Natural England is already seeing a change of emphasis ahead of any formal announcement of the outcome of the recent Triennial Review. The jury is still out (perhaps), but interim indications can be found on official Government websites. There is also some excellent opportunities for business to negotiate favourable outcomes if they make early approaches to the Governments advisers, ‘discretionary advice’ comes at a price but its all relative if it avoids a costly EIA required under EU regulations. NE will advise how to mitigate first which will avoid, in the words of the Chancellor George Osbourne “ridiculous burden on business'”. If there were a referendum, a public vote, would the “Muzzled Watchdog” be put out of its misery and culled? Its certainly a good lapdog these days, helping developers, assisting landowners – I must look up its statutory duties, unless they too have been culled? Posted in Executive Secretary | Comments Off on The culls continue ….